Whether you have planted a garden or regularly frequent farmer’s markets, summer is the time for fresh fruit and vegetables. What better way to enjoy your summer bounty than sharing it with your pup? Listed here are summer fruits and vegetables that are safe for your dog to eat, as well as ones to avoid. Summertime fruits are a great supplement to your dog’s diet because they are refreshing and hydrating. Only feed fruits in moderation to your dog, as high sugar contents can cause an upset stomach or hyperactivity. Apples are a favorite for many dogs and can be incorporated into their diet in numerous ways. Whether served raw, baked, or pureed your dog will reap the benefits of vitamin C, vitamin A, and fiber. Raw apple also helps clean teeth and freshen breath! 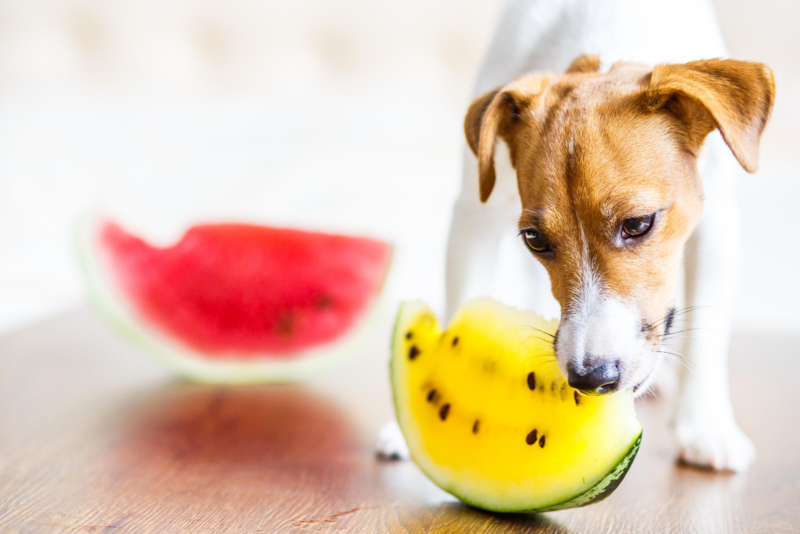 A true summertime favorite, watermelon is a hydrating treat for dogs. Watermelon is full of vitamin A, vitamin C, vitamin B6, and potassium, which makes this treat especially healthy. Pet owners can freeze watermelon chunks to make this treat extra-cooling. Just be sure to avoid feeding seeds or rinds. Cantaloupe is an antioxidant powerhouse that is loaded with beta carotene, vitamin A, folate, niacin, and potassium. Like watermelon, cantaloupe can be easily frozen and served as a cooling treat. Blueberries are a favorite treat of dogs and can be given in place of your pet’s training treats. Feed fresh or frozen blueberries for improved urinary health and protection against cancer and inflammation. Peaches provide an immune system boost for dogs, which means they are a great summertime treat for pups. Peaches can be fed fresh or frozen, but the peach pit should never be given to pets. Like blueberries, raspberries are another great treat for dogs, whether fresh or frozen. Chock full of the same immune system-boosting antioxidants, raspberries are a healthy and delicious summertime treat. Kale is considered a superfood, and with good reason. This green leafy vegetable is high in vitamin K, beta carotene, vitamin C, and carotenoid pigments. While kale can be fed raw to your dog, lightly cooking or steaming the kale and then adding it to your pet’s food is recommended to reduce the risk of gas. Like kale, spinach is high in antioxidants and vitamins such as vitamin A, vitamin B, vitamin C, vitamin E and vitamin K. Spinach should be cooked when fed to your dog as raw spinach contains oxalate which can inhibit calcium absorption. Green beans are a wonderful treat for your pet, particularly if your dog is overweight. This garden vegetable is low in calories, high in fiber, and high in nutrients. You can give your dog cooked green beans as a snack or replace ¼ cup of your dog’s food with ¼ cup of green beans to aid in weight loss. 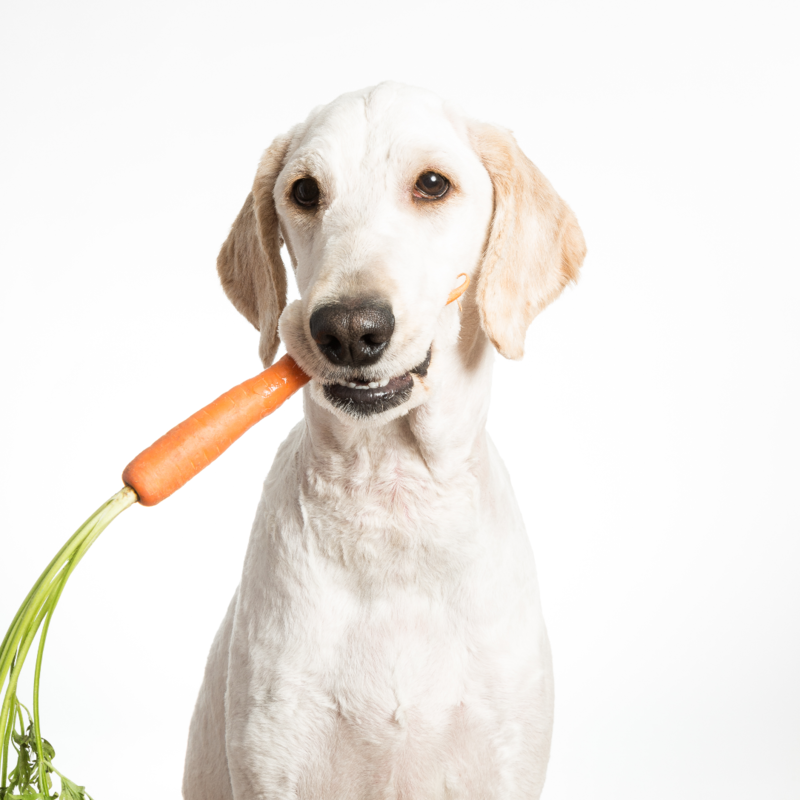 Carrots are high in fiber and vitamins, but the main reason to feed your dog this orange vegetable is for oral health. Raw carrots both clean teeth and freshen breath for a healthier mouth. Since carrots are high in fiber, pet owners should only feed carrots in moderation. While tomatoes are safe for dogs in moderation, dogs should never be allowed to consume green portions of the tomato plant. The stem and leaves contain solanine, which can be toxic in large quantities. Grapes and raisins can be highly toxic to dogs, even in small quantities. The main danger of grapes and raisins is fatal kidney failure, which generally doesn’t manifest for 48 – 72 hours. If your dog consumes grapes or raisins, seek help from a veterinarian immediately. While rhubarb stems are generally recognized as safe for dogs to eat, the leaves are very toxic. If your dog consumes a rhubarb pie, he or she may experience gastrointestinal upset from the high sugar content, but otherwise should make a full recovery within a few hours. Ultimately, knowing which summer fruits and vegetables are (and are not) safe for your pet can enhance his or her quality of life. Sharing summer produce with your dog can be fun and rewarding, just be sure to practice portion control and moderation to prevent an upset stomach! Have you been waiting to try WINPRO supplements? 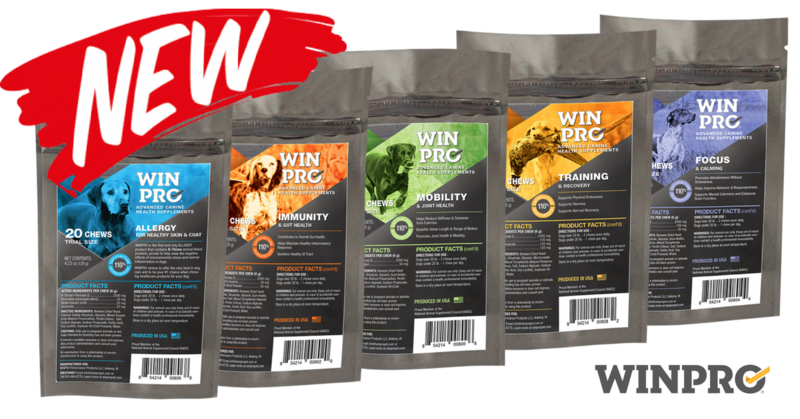 You can now purchase our WINPRO supplements in Trial Pack Sizes! Each trial size pouch contains 20 chews for a low cost of $12.99. We've listened to your feedback and have heard that your number one reason for hesitating to purchase, is fear of spending the money on something that you're not sure works, or if your dog will even like it. If you've been on the fence about trying any of our canine supplements, our new trial pack sizes offer you the perfect opportunity to give it a try! Take a look at the products and select Trial Size under each product line!